Some of the Instructions on spiritual life of the holy Abba Dorotheos of Gaza (Aug. 13) are to be found in the Philokalia. A marvelous fruit of these Instructions may be seen in the life of the disciple of Abba Dorotheos, St. Dositheos. The account that follows, included as a part of the Russian edition of the writings of Abba Dorotheos, is by an anonymous writer apparently contemporary with the two saints, and is an inseparable part of the life of the great Abba himself. Dositheos the boast of the obedient. Abba Dorotheos, in truth blessed, having come to love the monastic life according to God, went away to the coenobium of Father Seridos, where he found many great ascetics living in silence, of whom surpassing all were the two great Elders, St. Barsanuphios and his disciple and co-ascetic, Abba John, called the Prophet from his gift of clairvoyance and which he possessed from God. St. Dorotheos gave himself over to them in obedience with complete confidence, and spoke with the great Elder (Barsanuphios) through the holy Father Seridos; but Father John the Prophet he was honored also to serve. The above-mentioned holy Elders found it necessary for St. Dorotheos to establish an infirmary; and having settled there, he himself had the care of it, for the brethren were very sad that when they fell ill they had no one to look after them. And thus, with the help of God, he established an infirmary on the means of his own brother, who provided him with everything necessary for establishing it, for he was a man very Christ-loving, who loved monks also. So, Abba Dorotheos along with several other pious brethren served the sick and as head of the infirmary, supervised this institution. 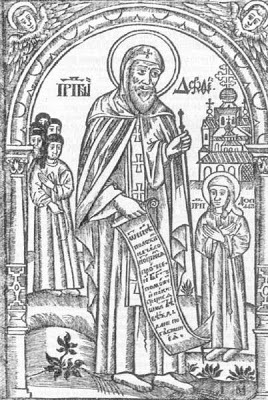 Once, the abbot, Abba Seridos, sent for him to come to his quarters. When Dorotheos entered he found there a certain youth in military dress, quite young and handsome, who had just been visiting the monastery in the retinue of a prince whom Fr. Seridos loved. When Abba Dorotheos entered, Abba Seridos took him aside and said to him: "These people have brought this youth to me, saying that he wishes to remain in the monastery and be a monk; but I am afraid that he might belong to one of the great noblemen; and if he has stolen something or such like and wishes to hide, and we accept him, we will have trouble; for neither his dress, nor his appearance indicate a man who desires to be a monk." This youth was a relative of a certain general, lived in great indulgence and luxury (for the relatives of such great lords always lived in great indulgence), and had never heard the word of God. Once, a certain member of the general's retinue spoke in his presence about the holy city (Jerusalem). After listening to him, the youth conceived the desire to see the holy shrines there, and begged the general to send him to see the holy sites. Not desiring to disappoint him, the general sought out a close friend of his who was going there and said to him: "Do me a favor, take this youth with you to look at the holy places." Having taken this young man from the general, he showed him every honor, looked after him, and offered to let him eat together with himself and his wife. Thus, having reached the holy city and venerated the holy places, they came also to Gethsemane, where there was a representation of the Last Judgment. When the youth stood before this representation and beheld it attentively and with awe, he saw a magnificent Woman, clothed in purple, who stood beside him and explained to him the torture of each of the condemned, giving at same time several other instructions of Her own. Hearing this the youth was amazed and wondered, for, as I have already said, he had never heard the word of God or that there was to be a judgment. Then he said to Her: "Lady, what must I do to be saved from these tortures?" She answered him: "Fast, do not eat meat, and pray often, and you will be saved from the tortures." Having given him these three commandments, the Woman clothed in purple became invisible and appeared no more to him. The youth went over that whole place seeking Her, supposing that it had been an ordinary woman, but did not find Her; for it was Holy Mary, the Mother of God. From that time forth this youth remained in a state of contrition and kept the three commandments that had been given him. The friend of the general, seeing that he was fasting and not eating meat, sorrowed over this for the general’s sake, for he knew that the general had a special concern for this youth. However, seeing his conduct, the soldiers who were with him said to him, "Young man! What you are doing is not suitable for a man who wants to live in the world; if you wish to live like this, then go to a monastery and you will save your soul." 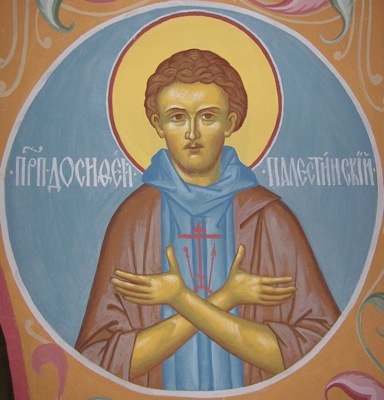 Knowing nothing divine, neither what such a thing as a monastery was, and only observing what he had heard from that Woman, he said to them: "Lead me wherever you know, for I do not know where to go." Several of them, as I have said, were beloved of Abba Seridos, and in visiting the monastery they brought this youth along. When the Abba sent the blessed Dorotheos to speak with him, Abba Dorotheos tested him and found that the youth could say nothing to him other than, "I wish to be saved." Then he came and said to the Abba: "If you are pleased to accept him, fear nothing, for there is nothing evil in him." The Abba said to him: "Do me a favor: take him yourself for his salvation, for I do not wish him to be in the midst of the brethren." Abba Dorotheos in his piety refused for a long time, saying: "It is beyond my strength to take someone else's burden upon myself, and this is not within my means." The Abba replied to him: "I bear both your burden and his; over what, then, do you grieve?" Then the blessed Dorotheos said to him: "If you have so decided, then inform the Elder (Barsanuphios) of this, if it pleases you." The Abba replied to him: "Good, I shall tell him," and went to inform the great Elder of this. Then the Elder said to blessed Dorotheos: "Take this youth, for God will save him through you." Then he took him with joy, and appointed him to serve with in the infirmary under his supervision. His name was Dositheos. When the time came to eat food, Abba Dorotheos said to him: "Eat until you are full, only tell me how much you eat." He came and said to him: "I ate a loaf and a half of bread, and in a loaf there are three pounds." Abba Dorotheos asked him: "Was this enough for you, Dositheos?" He replied: "Yes, my lord, this was enough for me." The Abba asked him: "Are you not hungry?" Then Abba Dorotheos said to him: "No, master, I am not hungry." Then Abba Dorotheos said to him: "Next time eat one loaf, and divide the other half-loaf into halves; eat one quarter, and the other quarter divide in two, and eat one half." Dositheos did as he was told. When Abba Dorotheos asked him: "Are you hungry, Dositheos?" he replied, "Yes, lord, a little hungry." In a few days he again said to him: "How is it with you, Dositheos, do you continue to feel hungry?" He answered, "No, lord, by your prayers all is well with me." The abba said to him: "Then put aside also the other half of the quarter." He did this. Again in a few days Abba Dorotheos asked of him: "How is it with you now, Dositheos, are you not hungry?" he replied: "It is well with me, lord." The abba said to him: "Divide the other quarter also in two, and eat half, and leave half." He did this. And thus with God's help, little by little, from four and a half pounds he stopped at eight ounces; for, consumption of food is also a matter of habit. This youth was quiet and skillful in everything he did. He served the sick in the infirmary, and each one was set at ease by his service, for he did everything carefully. If it happened that he took offense against one of the sick and said something to him in anger, he would leave everything, go into the storeroom and weep. And when the other attendants of the infirmary would go in to console him and he would remain inconsolable, they would go to Fr. Dorotheos and say to him: "Father, be so kind as to go and find out what has happened with this brother: he is weeping, and we do not know why." Then Abba Dorotheos would go in to him, and finding him sitting on the ground and weeping, would say to him: "What is it, Dositheos, What is wrong with you? What are you weeping about?" Dositheos would say: "Forgive me, Father, I got angry and spoke evilly with my brother." The Father would reply to his: "So, Dositheos, you get angry and you aren't ashamed that you get angry and offend your brother? Don't you know that he is Christ and that you are offending Christ?" Dositheos would bow his head weeping, and answer nothing. And when Abba Dorotheos would see that he had already wept enough, he would quietly say to him: "God will forgive you. Stand up; from now on make a new beginning; let us try, and God will help." Hearing this, Dositheos would immediately stand up and joyfully hasten to his work, as if he had truly received forgiveness and advice from God. In this manner those who served in the infirmary became familiar with Dositheos’s custom, and whenever they saw him weeping would say: "Something has happened with Dositheos, he has sinned again in something." They would say to blessed Dorotheos, "Father, go to the storeroom, there is something for you to do there." When he went in and found Dositheos sitting on the ground and weeping, he would conjecture that he had said an evil word to someone. And he would say to him: "What is it, Dositheos? Or have you offended Christ again? Or grown angry again? Aren't you ashamed? Why don't you correct yourself?" And Dositheos would continue weeping. And when Abba Dorotheos again would see that he had had his fill of weeping, he would say to him: "Stand up, may God forgive you; make a new beginning again and correct yourself at last." Dositheos in faith would immediately throw off that sorrow and go about his work. He made the beds of the sick very well, and had such freedom in confessing his thoughts that often, when he would be making a bed and see that blessed Dorotheos was passing, he would say to him, "Father, Father, the thought says to me: ‘you are making the beds well.’" And Abba Dorotheos would answer him: "O, the wonder! You've become a good slave, a distinguished bed-maker—but are you a good monk?" Never did Abba Dorotheos allow him to have an attachment to any kind of thing, for whatever it might be. Dositheos accepted everything that he said with faith and love, and eagerly obeyed him in everything. Whenever he needed clothing, Abba Dorotheos would tell him to sew it for himself, and he would go out to sew it with great care and eagerness. When he had finished, the blessed one would call him and say: "Dositheos, have you sewed that garment?" He would reply: "Yes, Father, I sewed it and finished it nicely." Abba Dorotheos would say to him: "Go and give it to brother so and so, or to such and such a patient." He would go and give it away with joy. The blessed one again would give him another set of materials, and likewise when he had finished sewing it, would say to him: "Give it to this brother, or to that sick one." He would go and give it away with joy. The blessed one would once again give him more, and likewise when he had finished it would say to him: "Give it to this brother." He would give it away at once, and never did he grow sad or murmur, saying, "Every time when I sew and carefully finish a garment, he takes it away from me and gives it to another," but rather fulfilled with eagerness every good thing that he heard. Once one of those sent on obedience outside the monastery brought back a very good and beautiful knife. Dositheos took it and showed it to Father Dorotheos, saying, "Such a brother brought this knife, and I took it so as to have it, if you command, in the infirmary, because it is a good one." However, Blessed Dorotheos never obtained anything beautiful for the infirmary, but only whatever was useful. And therefore he said to Dositheos, "Show it to me; I will see whether it is good or not." He gave it to him, saying, "Yes, Father, it is good." The Abba saw that it was indeed something good, but since he did not want Dositheos to have an attachment to anything at all, he did not command him to carry this knife and said, "Dositheos! Do you really want to be a slave to this knife, and not a slave to God? Hearing this, Dositheos did not raise his head, but cast his face down in silence. Finally, having sufficiently scolded him, Abba Dorotheos said to him, "Go and put the knife in the infirmary, and never touch it." Dositheos then so guarded himself from touching this knife that he did not dare take it even in order to give it to someone else, and while the other attendants would take it, he alone would not touch it. And he never asked, "Am I not also the same as all the others?" but everything that he heard from the father he fulfilled with joy. Thus did he spend the brief time of his stay in the monastery, for he lived there only five years. He died in obedience, never having carried out his own will in anything, nor having done anything out of attachment. When he fell ill and began to spit blood (from which he died), he heard from someone that soft-boiled eggs were good for those spitting blood. Blessed Dorotheos also know about this and was concerned with Dositheos’s treatment, but because he had so many things to do, this remedy didn't enter his mind. Dositheos said to him, "Father, I wish to tell you that I have heard about something good for me, but I do not wish you to give it to me, because the thought of it is troubling me." Dorotheos answered him, "Tell me, child, what is this?" He answered him, "Give me your word that you will not give it to me, because, as I said, the thought disturbs me over this." Abba Dorotheos said to him, "Alright, I will do as you wish." Then the sick one said to him, "I heard from some that soft-boiled eggs are good for someone spitting blood; but for the Lord's sake, if it please you, what you didn't give me before of your own accord, do not give me now for the sake of my thought." The Abba replied to him, "All right, if you do not wish it, I will not give it to you; only do not be distressed." He tried to give the lad other medicines useful for him in place of the eggs, for Dositheos had said that the thought was disturbing him regarding eggs. Behold how he labored to cut off his own will, even in such an illness. He furthermore always had the remembrance of God, for Abba Dorotheos had commanded him to say constantly, "Lord Jesus Christ, have mercy on me," and also, "Son of God, help me," thus he would always utter this prayer. And when his illness became quite severe, the blessed one said to him, "Dositheos, take care over the prayer, see that you be not deprived of it." He answered, "Very well, Father, only pray for me." Again, when he his condition grew yet worse, the blessed one said to him, "Well, Dositheos, how is the prayer, does it continue as before? "He answered him, "Yes, Father, by your prayers." But when it became extremely difficult for him and the illness became so severe that he had to be carried on a stretcher, Abba Dorotheos asked him, "How is the prayer, Dositheos?" He answered, "Forgive me, Father, I cannot keep it up any longer." Then Abba Dorotheos said to him, "Then leave off the prayer, only keep God in mind and think of Him to yourself as if He were before you." Suffering terribly, Dositheos informed the great Elder (Barsanuphios) of this, saying, "Let me go, I cannot bear any more." To this the Elder answered him: "Have patience, child, for the mercy of God is near." But seeing that he suffered so terribly, Blessed Dorotheos grieved over this, fearing lest his mind suffer harm. Within a few days Dositheos again informed the Elder concerning himself, saying, "My Master, I cannot live any longer"; then the Elder answered him, "Go, child, in peace, stand before the Holy Trinity and pray for us." Hearing the Elder’s reply, the brethren began to be indignant and say, "What did he do that was special, or what kind of ascetic exploit did he perform that he should hear these words?" For indeed, they had not seen that Dositheos had especially labored in asceticism, or eaten food only every other day, as did some others who were there, or that he had kept vigil beyond the usual Vigil service—he did not even awaken for the beginning of the Vigil itself. Neither did they observe that he had had any special abstinence, but on the contrary they noticed that if by chance the sick would leave a little gravy or fish heads, or anything like that, he would eat it. And there were monks there who, as I have said, for a long time ate every other day and doubled their vigils and abstinence. When the latter heard that the Elder had sent such a reply to a youth who had been in the monastery only five years, they were disconcerted, not knowing his deeds and his undoubted obedience in everything. They did now know that he had never done his own will in anything, that if blessed Dorotheos ever chanced to say something even in fun to him, or even seeming to indicate that he should do one thing or another, he promptly went and did it without thinking. For example, in the beginning he spoke loudly out of habit; blessed Dorotheos, making fun of him, once told him, "Perhaps you could use some wine and bread, Dositheos? All right, go and get some wine and bread." Hearing this, he went to fetch a cup of wine and bread and gave it to the elder in order to receive his blessing. Not understanding this action, Abba Dorotheos looked at him with wonder and said "What do you want?" He replied, "You ordered me to get some wine and bread, so give me your blessing." The elder replied, "Fool, since you yell like the Goths when they get angry while drinking, I told you to get some wine and bread, for you are as loud as a Goth." At this, Dositheos bowed down and took back what he had brought. Once he likewise came to ask Abba Dorotheos concerning a phrase of the Holy Scripture, for because of his purity he had begun to understand the Holy Scripture. Blessed Dorotheos, however, did not want him to devote himself to this, but rather to guard himself the better by means of humility. And so, when Dositheos asked him, he answered, "I don't know." But Dositheos did not understand his father's intent, and so he came again to him and asked him concerning another chapter. Then he said to him, "I don't know—go ask the Father Abbot," and Dositheos went, without thinking anything in the least. Abba Dorotheos, however, told the Abbot in advance, "If Dositheos comes to you to ask about something in Scripture, hit him a little." And thus when he came and asked the Abbot, the latter began to push him, saying, "Why don't you sit quietly in your cell and be silent if you don't know anything? How do you dare ask about such subjects? Why don't you concern yourself with your own impurity?" After saying few other things like this to him, the Abbot sent him away with two light blows on the cheeks. Dositheos returned to Abba Dorotheos and showed him his cheeks, which had become red from the blows, and said, "Here's what I received for an answer." He did not say, "Why did you not teach me yourself, instead of sending me to the Abbot?" He said nothing of the sort, but he accepted everything with faith, without thinking anymore about it. And when he would ask Abba Dorotheos concerning some thought, he would accept what he heard with such assurance and observe it so exactly that he would not ask a second time concerning the same thought. Thus, not understanding, as I said, this wondrous obedience, certain of the brethren murmured over what was said to Dositheos by the great Elder. And when God wished to reveal the glory prepared for him because of his holy obedience, and likewise the gift for the salvation of souls which blessed Abba Dorotheos possessed even though he himself was yet a disciple, and his ability to so surely and quickly set Dositheos before God—a short time after Dositheos’s blessed repose the following happened: A certain great elder, who came from another place to the brethren in the coenobium of Abba Seridos, conceived a desire to see the previously departed holy Fathers of this monastery and prayed God that He would reveal them to him. He then saw them all together, standing as in a choir, and in their midst was a certain youth. The Elder later asked: "Who is that youth whom I saw amidst the holy Fathers?" When he described the features of his face, all recognized that it was Dositheos and they glorified God, astonished at what heights a youth who had previously come from such a lifestyle and home was able to attain in such a short time, by virtue of the fact that he had obedience and cut off his own will. For them all let us give glory to God Who loves mankind, now and ever and unto the ages of ages. Amen.